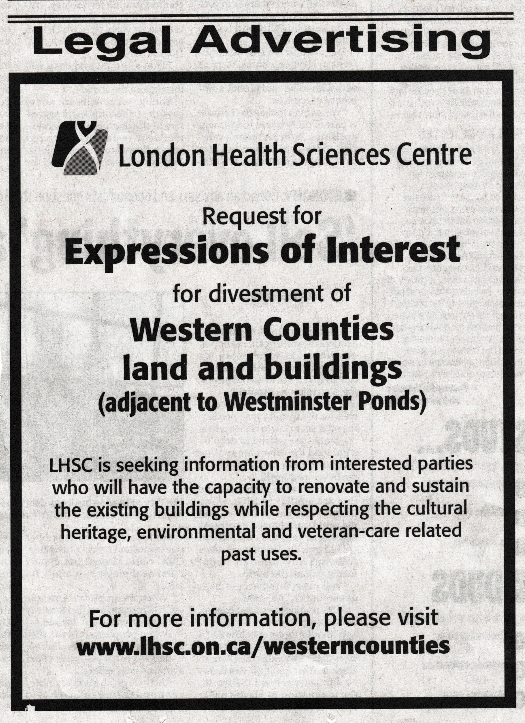 This ad appeared in the London Free Press on January 13, 2016. 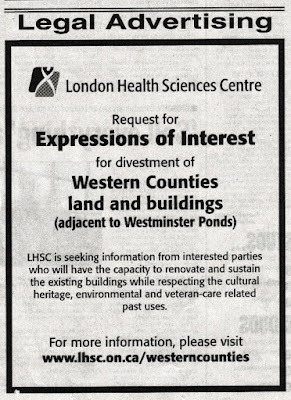 London Health Sciences is looking for a nonprofit group to take 2.3 hectares and four heritage buildings off their hands. The land, known as the Western Counties property, is just north of Westminster Ponds. The nonprofit group that acquires the land should be willing to renovate and maintain the buildings and preserve the land "while respecting the cultural heritage, environmental and veteran-care related past uses." The reference to veterans is because the site opened in 1948 as Western Counties Health and Occupational Centre. Veteran Affairs ran it as a rehabilitation centre for years and the site eventually evolved into a retirement home for veterans. Patients were moved to Parkwood Hospital in 1989. The four buildings are called the Wellington, Bruce, Huron, and Perth Pavilions. Bruce is currently rented to ReForest London and other environmental groups. Huron houses the Secrets of Radar Museum. The Wellington is currently vacant and, at 8000 sq. ft., may be just what a non-profit group is looking for to house its offices or activities. The cottages are located in a beautiful natural setting by the ponds, a real hidden gem within the sprawl of south London. Perhaps too well hidden. Any group that takes over the building will need detailed driving instructions on its website. But if you're that group, here's your opportunity. Expressions of Interest will be received until March 18, 2016. Update, March 2018: ReForest London and the Thames Talbot Land Trust have an ambitious multi-million dollar plan to refurbish the buildings. Having bought the site from the hospital for the awesome sum of $10, they hope to offer programs to the public in environmental sustainability. Stay tuned; it will probably be several years before this becomes a reality. I found your blog I was researching my great-great grandfather who was active at the Kensal Park Baptist Church (https://familysearch.org/photos/stories/7170244) that is now The Springs restaurant. My grandma told me that he was mentioned in the newspaper that was discovered in the time capsule that was found when the foundation collapsed (http://www.lfpress.com/life/eat/2011/11/29/19036176.html) I was wondering if you might know anything about what happened to the contents of the time capsule that was discovered or how I might obtain a digital copy of the newspaper that was discovered? (http://www.lfpress.com/news/columnists/ian_gillespie/2010/11/02/15928686.html) my grandma thinks that there is something to do with her grandfather in that newspaper. Hi Faith. Unfortunately, I don't know what happened to the time capsule. I would try contacting the restaurant itself or perhaps Ian Gillespie.